5. load the same rom and play. If you want Ad-Hoc Multiplayer working on android, you need Port-shifting support. Just change Port offser, it should >=1024. onelight!! You did a great job!! onelight! With this PATAPON 3 multiplayer it is possible? (11-06-2015 03:00 AM)PPSSPP-SAGA Wrote: onelight!! You did a great job!! 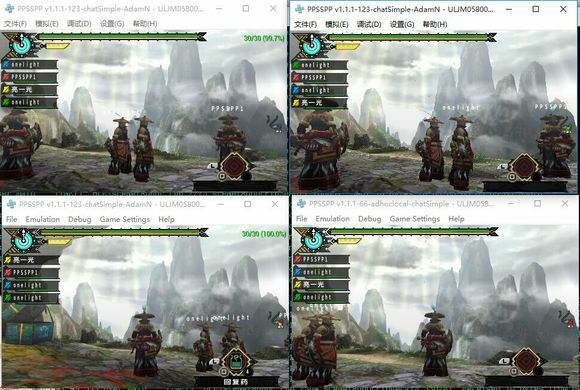 If I am right AdamN'S Port-shifting and multiple PPSSPP not help multiplayer Compatibility. PATAPON 3 multiplayer only working when using PPSSPP-PC with PSP, or JPCSP with PSP. thanks alot. finally i can play dbz multiplayer on android. How would I setup two players on one PC and someone playing on Android? I have the two players on the PC connected with no problems just need to connect another through Android. (11-22-2015 09:14 PM)RowdyRocket Wrote: How would I setup two players on one PC and someone playing on Android? I have the two players on the PC connected with no problems just need to connect another through Android. It won't work that way. you can try 3 player on one PC. OK thanks Onelight. The problem I'm having with more then two players on the PC is control. I must be missing something. The first player uses my Xbox controller, the second uses a controller mapped to keyboard keys using AntiMicro. For this one the window had to be active to receive keyboard presses (I haven't found an option for background keyboard yet?) So the third would be another Xbox controller but how do I set it up if only one window can be active? Thanks for your help. I'd love to get this working! (11-23-2015 05:08 PM)RowdyRocket Wrote: OK thanks Onelight. The problem I'm having with more then two players on the PC is control. I must be missing something. The first player uses my Xbox controller, the second uses a controller mapped to keyboard keys using AntiMicro. For this one the window had to be active to receive keyboard presses (I haven't found an option for background keyboard yet?) So the third would be another Xbox controller but how do I set it up if only one window can be active? I didn't try 3 PPSSPPs on one PC. I didn't have 3 XBOX controller also. Hmm.. I wish I was getting that result. It detects my first controller no problem but doesn't recognize any of the others. I'm using the SCP Tool Kit which shows all the controllers active. They are also detected in other programs? Do any of you guys have any ideas on what I can try to get them detected or should I move this to a different area? If I use the SCP monitor and change any of the controllers to Pad 1 then it works no problem, so it doesn't appear to be a controller issue. PPSSPP recognizes the first controller as x360 but as I said before all others are ignored? Any help would be greatly appreciated. Edit: searched through the code and found that the Xbox controller (xInput) was only limited to one controller. Generic pads (dInput) were setup for four in some places up to ten controllers. Looks like an easy fix. The problem is I don't have any dInput pads to test with. Though I have been able to get it to detect the Xbox controllers I have so far with no issues. Port Shifting rocks Onelight! Thanks for your efforts! I'm still having controller issues so I haven't been able to test more then two players. Works great with two players though! Thanks again. How do I grab the source code for this mod? I'm wanting to fix the multiple Xbox controller detection. I was able to get them working with the master just wanting to try it on co-op. I tried pulling from the 8134 link at the top of your post but when I build it I received errors pertaining to directx9. So I merged only the modified files with my copy of the master. I was then able to get it to build but when I tried multiplayer on the same PC using your directions here I was unable to do so. Did you also modify them to make this possible? Or am I missing something? @Onelight or anyone else that's tried. Do you get interference when playing multiplayer on the same PC with everyone using controllers? I've been working with the xInput and have got it working but after the third person joins control distortion begins. Curious if this also happens with dInput. I have nothing to test with. (12-04-2015 05:34 PM)RowdyRocket Wrote: How do I grab the source code for this mod? I'm wanting to fix the multiple Xbox controller detection. I was able to get them working with the master just wanting to try it on co-op. Thank You Onelight! That did it. Can I play Dissidia 012 Final Fantasy multiplayer on this build with android?